Grieving the loss of someone you love can be a difficult and lonely journey. Grief can be overwhelming trying to understand the emotional, physical, and spiritual effects it has on our lives. 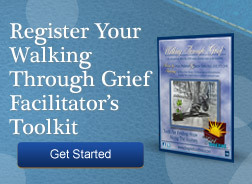 Walking Through Grief DVDs can help. Each DVD in the Walking Through Grief series provides a wealth of education and insight from some of today's top professionals who will help you understand more fully the grieving process. Every program also features inspirational stories from others who have found hope once again after great loss in their lives. If you, or someone you love is grieving, learn more about how Walking Through Grief DVDs can help you on your journey of grief.